Follow my blog and get al tasty recipes in your inbox! Sharing the passion for food! Autumn and rainy days. Time for friends and dinners in candlelight. And of course chocolate, Lots of it! 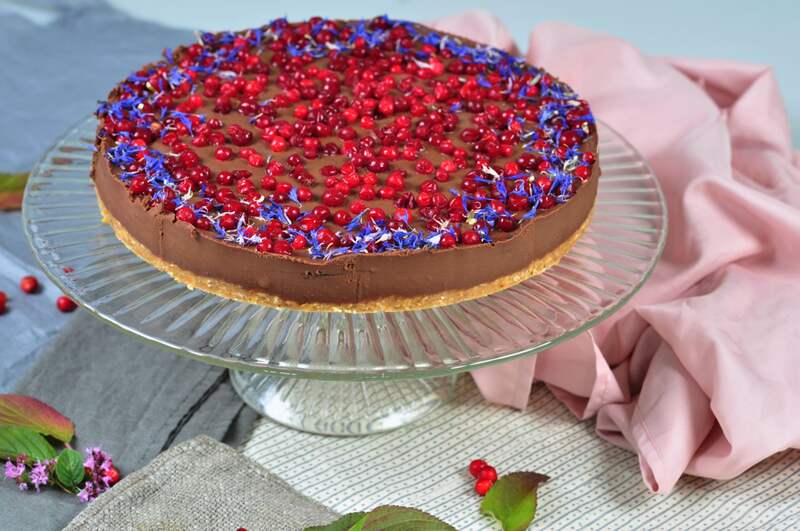 The first post after this summer’s busy days for me turned into a chocolate cake with intense red lingonberries, dark chocolate, a fun bottom layer with red lentils and dried blue cornflowers with a hint of midsummer bright nights. This is not a difficult cake to make but it requires some preparation. The lentils should be soaked for 12 hours and the chocolate fudge sauce should boil for about an hour. Part from the time you need its al very easy to make, above all, very tasty. Some whipped “cream” or equal is not a bad idea to add when serving. Al together, I promise you a nice desert on the dinner table in September. If you have trouble finding the typical Swedish lingonberry, you could also replace it with cranberries roughly cut in smaller pieces or red currants if you can find that. 1. Soak the red lentils for at least 12 hours, completely covered by cold water. 2. Pour out the lenses and rinse them in a sieve. 3. Add all the lentils in a dry frying pan and bake them at low heat while stirring until they are softly roasted, completely dry and slightly colored. It takes about 10-15 minutes. Finally sprinkle the sugar on top of the lentils, let it melt and caramelize with the lentils in the pan for some minutes. Pour over the lentils on a baking sheet and allow to cool slightly. Take about half of the lentils and pour into a food processor. Grind the lentils into a fine flour. 4. Melt the butter and pour it into a bowl. Add the lentil flour and stir it al together. Add the remaining whole lenses, this is so you will get some mastication in it. If you prefer it less grainy and more even, mix all the lentils to a flour and then add it to the butter. 5. Add the lentils to a baking tin, the bigger tin you choose, the thinner the cake will be. 6. Pour the condensed coconut milk sauce with chocolate (see recipe below) and our it on top of the lentils. Spread it out evenly with a spoon. Sprinkle about 3 dl lingon on top of the chocolate. Decorate the cake with some dried leaves of cornflowers or other beautiful edible flowers. Set the cake in the refrigerator a few hours before serving, making it easier to cut. 1. Take a deep and preferably a big pan, it will bubble a nd make a mess otherwise. 2. Pour the coconut milk and syrup into the pan. Stir and let everything come to a boil. Lower the heat slightly so that the coconut milk can boil with small bubbles constantly. Stir occasionally with a wooden slab. Cook for about 1 hour. 3. Now, by now the coconut milk should be reduced by about two-thirds. Continue the boiling, but stir more frequently in the pan for the last 15 minutes to see when it is slightly thicken or until about 1/3 remains. Add the chocolate and let it melt into the sauce. Blend it al together with a hand blender. 4. Pour in the condensed coconut milk sauce in a can. If you do not use everything at once, keep it in the fridge. This cake is free from gluten, lactose and eggs. Food, in the end, in our own tradition, is something holy. It's not about nutrients and calories. It's about sharing. It's about honesty. It's about identity.